RECOM has expanded its low power AC/DC portfolio with encapsulated 5 W power supplies, which operate up to +90°C. They accept input voltage lines of up to 305 VAC and offer peak power capability up to 6 W. These modules are well suited for Industry 4.0, IoT and smart household applications requiring features that go beyond the industry standard. With its RAC05-K/277 series, RECOM introduces 5 W AC/DC converters that support peak power needs and are specially designed for extended input lines and reliable operation at extreme temperatures from -40°C up +90°C. The RAC05-K/277 series are built to operate from extended input lines with mains voltages from 85 VAC up to 305 VAC, are EMC compliant to EN55022 class “B” with a minimum 6 dB margin on both radiated and conducted readings without the need for external components. At a 1” x 1.25” footprint, these new PCB-mount or wired modules feature fully protected outputs and international safety certifications for industrial, household and ITE for worldwide use. The RAC05-K/277 series is an addition to RECOM’s ultra-compact RAC05-K converters with a 1” x 1” footprint, as well as the recently released RAC05-K/480, an AC/DC module dedicated for phase-to-phase operation up to 528VAC and exclusive only to RECOM. Wired versions of the RAC05-K/277 series are due to be released in October of 2018. Samples of the pin-versions and OEM pricing are available from all authorized distributors or directly from RECOM. 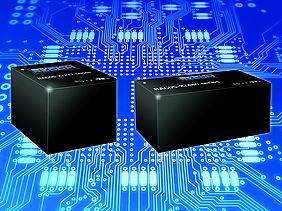 This entry was posted in Industry & Enterprise, Product News and tagged AC-DC power supplies, Industry 4.0, IoT, power supplies, smart home by Circuit Cellar Staff.